AOL Desktop versions 10.0, 9.0, 8.0, 7.0, 6.0, etc. This tool gives its users ability to open & view PFC files without AOL and export them into Outlook PST file format. There is no file size limitation on AOL file. It means that you can transfer PFC files of any size to Outlook & you can also break large Outlook PST file for better management of data. A user can move all the AOL emails to office 365 Account with the help of AOL PFC to Office 365 converter. The software provides two options to export the data. A user can migrate multiple mailboxes with or without impersonation in Office 365. Just after adding PFC file into the software, it generates an instant preview of all the data items in the AOL file with their associated metadata and attachments. It will be displaying emails in a well-structured format with attachments. AOL PFC to PST converter is providing an outstanding feature to move only the desired emails or folders into Outlook. One just needs to select files/folders using specific Date filter, which they want to transfer in PST file. The Easy-to-handle layout of the tool provides a practical approach to the user achieve the complicated PFC to PST migration effortlessly. The interface is designed with very few amount of technicalities within it. AOL PFC to Outlook Email Converter exports AOL email files to Outlook without harming the meta attributes. The email header information like time, date, To, Cc, Bcc, etc. remains the intact even after the conversion. AOL PFC to Office 365/PST Converter is compatible with Microsoft Windows 10, 8.1, 8, and all below versions. Moreover, it supports PFC files of all AOL-desktop versions without any stuck. In this world of simplicity, none of the person wants to stay on an individual platform because majority of users migrates email client with variations in trend. However, many users face a big challenge when they decide to switch from AOL email client to Outlook. As such, there does not exist any manual strategy to perform the same therefore, FreeViewer team have come up with an excellent approach for this migration. The name of this solution is AOL PFC to PST Exporter, which is an extraordinary software to convert AOL PFC files to PST. End users are no longer operating AOL mail services because of its difficult-to-manage interface and other issues. The trial version of the AOL Mail to PST Converter software allows a user to export only first 25 items/folder of AOL PFC file to PST & Office 365. 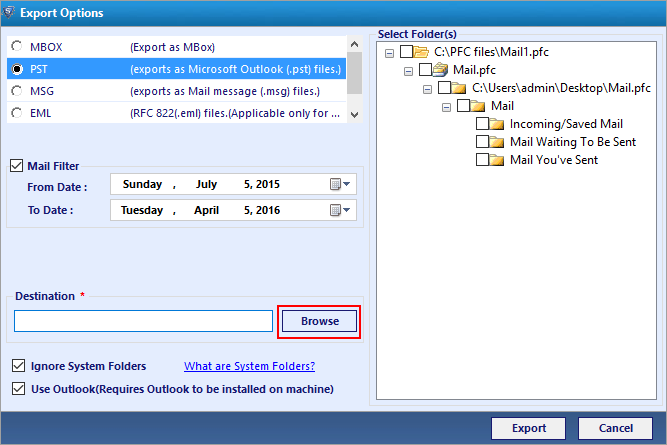 Installation of MS Outlook is optional to export AOL PFC file to PST format. Explain briefly about the working of the software? Step 1: Run the application and open the PFC file. Step 2: AYou can now view the contents of the PFC file. Step 3: Select the data items and click on Export button. Select PST or Office 365 option to migrate the data. Step 4: After apply filters to select specific data, browse the location where you want to save the exported file. Step 5: Click on Export button to proceed further. Step 6: After the successful conversion, you can view the resultant file in the saved location. Is there any solution to directly export PFC file to PST format without AOL installation? 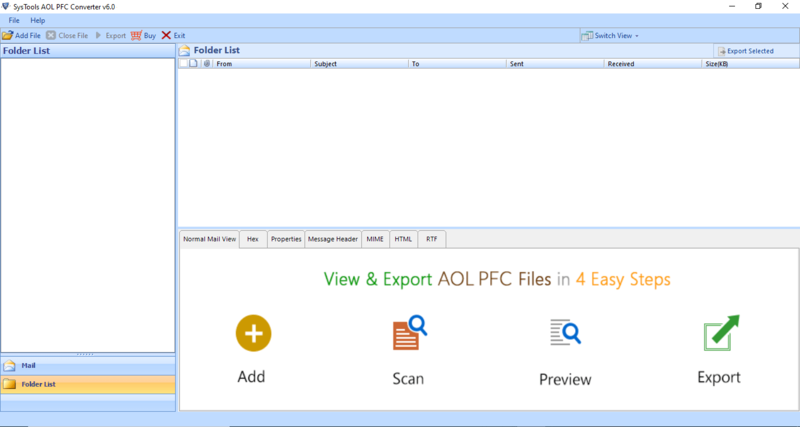 Yes, you can use this utility to open PFC files without AOL installation as well as you can convert them into Outlook. Will I be able to filter important PFC emails with help of your utility? Yes, you will be able to perform selective file conversion through our PFC to PST Converter software. Can I migrate multiple mailboxes from AOL Desktop application to Office 365 impersonation account? Yes, you can easily migrate your email platform from AOL to Office 365 with the help of this utility. How can I accomplish batch PFC to PST migration via this migrator software? 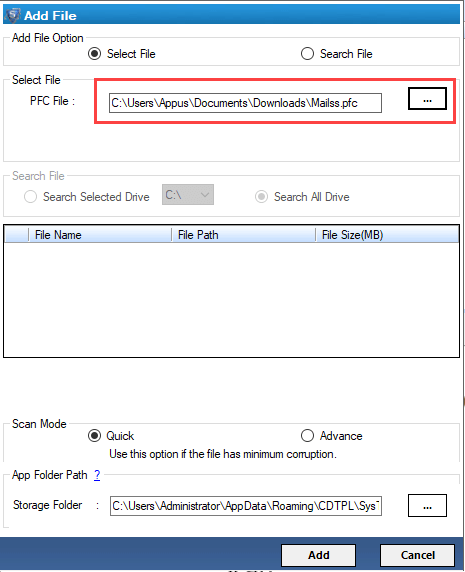 You need to add all your PFC files one-by-one in the converter interface and then convert AOL PFC to Outlook PST by selecting them to move in Outlook. Could I be able to work with your software even if I am not having any deep knowledge about AOL email program? Yes, of course, you will be able to operate our software without any technical knowledge either of Outlook or AOL. 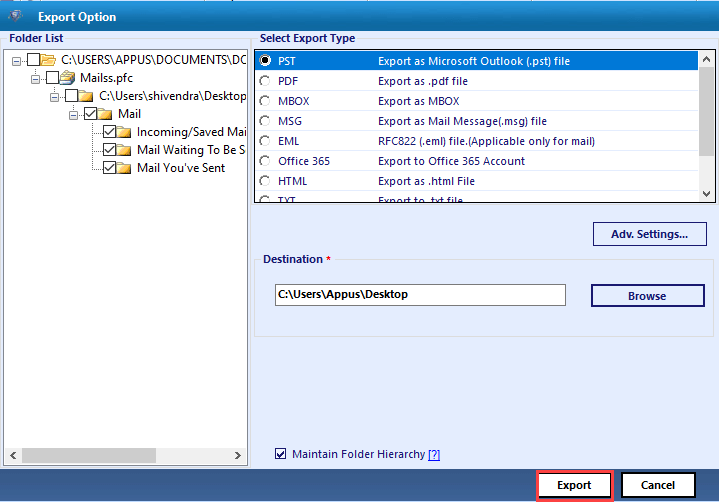 In fact, it is possible for a novice user to export PFC files to PST & Office 365. "I was in search for a solution by which I can convert AOL mail to Outlook because of some commercial need. I operated this PFC to PST converter software, which not only migrates files to PST but also enables users to open and read PFC files without AOL Desktop." "A perfect solution to export AOL PFC file to PST file is to use this software. The way this application works no other software can do this. It was really worth spending dollars on it and now without any data loss worry, I can move data from PFC file into PST and then, import it into my Microsoft Outlook profile." "With the help of AOL PFC to Office 365 migrator, I was able to export hundreds of mailboxes from AOL Desktop to O365 account. The tool really works smoothly and efficiently that I didn’t face any issue in migrating the mailboxes. Thanks for such an amazing tool!" "I want to convert AOL mailbox in MS outlook but I was unable to export as I am a non-technical person. But with help of AOL PFC to PST / Office 365 converter, I have migrated my data easily. The interface of the application is quite simple that it was easy to understand & perform the migration process." Open, read, convert and save the data of your AOL PFC files to PST files using this converter tool. Use the Pro version to explore your PFC file in the best possible way.